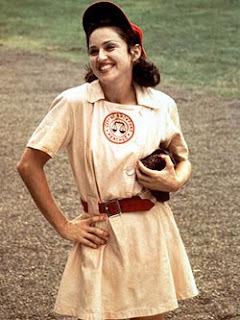 It's no secret that A League of Their Own is my absolute favorite movie of all-time. I remember seeing it in theaters in August 1992 at the Welfleet Cinemas and I've been obsessed ever since. After seeing a woman dressed as a Racine Belle outside Fenway Park last week (no, I did not ask why), the movie has been at the top of my mind. So for this week's Magical Monday Moment, I bring you the fantastically hilarious pair that was Rosie O'Donnell's Doris Murphy and Madonna's "All the Way" Mae Mordabito (remember, it's not just a name, it's an attitude). This scene is our first taste of the pair, and it only gets better from there.